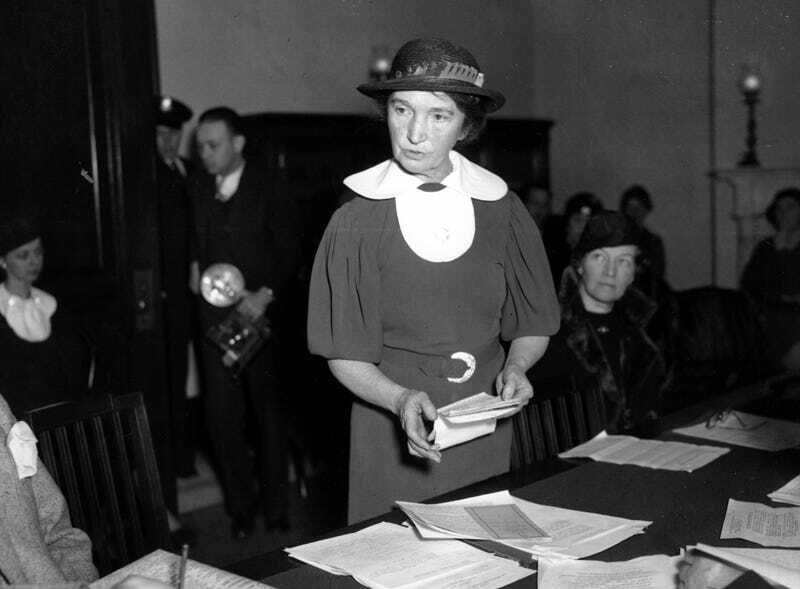 Margaret Sanger speaking before a Senate committee to advocate for federal birth control legislation in Washington. Image via AP. On October 16, 1916, Margaret Sanger, along with two other women, opened the nation’s first birth control clinic in Brooklyn, New York. They were promptly arrested, but that clinic evolved into what eventually became Planned Parenthood, one of the most important health resources for women across the country. That Planned Parenthood exists occasionally strikes me as a miracle. As a freelancer with worthless insurance, the ability to march into a Planned Parenthood and receive a battery of services for free or close to it has very nearly moved me to tears. When I read stories like this one from Fox News, (written by anti-woman hatemonger David Daleiden) about how Planned Parenthood is nothing but a purveyor of murdered baby parts, I want to toss my computer into a lake. Planned Parenthood provides abortions, thank god, but those only account for three percent of its services. Its detractors don’t care about the breast exams, the HIV tests, the prenatal care or any of the other essential, life-saving offerings that the clinic provides to anyone who walks through its heavily-fortified doors. They haven’t taken the time to read the facts inconvenient to their narrative, and I guess they don’t have to. It must be nice to speak from a place of such self-appointed authority and staggering privilege that you’re free to forge whatever misguided opinions you want. But this isn’t about them—not today, damn it. Nearly every woman has a story about how Planned Parenthood has helped—or saved—their lives. Feel free to share yours in the comments below. Happy birthday, Planned Parenthood. We’re thankful you’re here.